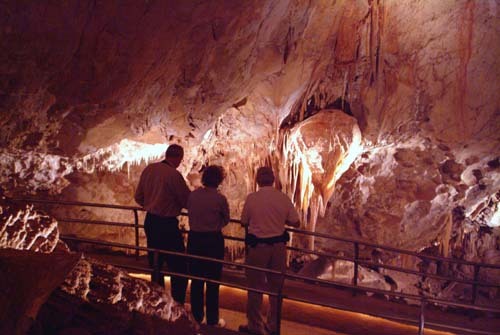 The excellent tour guides in the Big Roomhave many interesting stories about the cave as well as descriptive names for the many bizarre formations. For example, here the guide is pointing out a highlighted form on the right that they have called the Shield. I have not included these names and stories here --- this gives you something to look forward to when you visit the caverns. Instead I have tried to concentrate on the aesthetic qualities of this remarkable natural marvel.